Like some twisted case of schadenfreude — though usually at your own expense — horror games drive the desire to feel uncomfortable. While horror films have done this for decades by terrorizing moviegoers under the veil of a dark movie theater, horror video games inspire a different kind of terror: one driven by the fact that the player is fully in control of their character and that they have to press on and progress, even when they know something is waiting around the corner to tear them apart. Developer Red Barrels fully embraced this sense of terror with the studio’s first title, Outlast, back in 2013 on consoles and PC. Mixing the more traditional aspects of survival horror with the aesthetic of films such as The Descent and Paranormal Activity, Outlast drew acclaim not just for its found footage-style presentation, but for its gameplay and visuals that truly put players into “fight or flight mode” by completely stripping them of the ability to defend themselves. Four years after Outlast‘s release, Red Barrels has returned with the long-awaited sequel, Outlast II, that evolves what made the original game so compelling as a survival horror experience, and also ups the ante in significant ways when it comes to the series’ thrills and scares. Even in just the game’s opening hour, Outlast II sets the expectations for players that it has an objective, and one objective only: to scare the living hell of you. Set in the same time as the first title (but completely enjoyable on its own without having played the previous game), Outlast II sets players into the role of Blake Langermann, a photojournalist working alongside his wife, Lynn, to investigate the mysterious disappearance – and probable murder – of a pregnant young woman in the deserts of Arizona, known only as Jane Doe. The situation takes a quick turn for the worse, however, as Blake becomes stranded in the mountain ranges with a crashed helicopter, has no signs of Lynn in sight, and soon encounters a hillside society of cultists that are preparing for the end times of humanity. Part of that preparation includes the ritualistic sacrifice of women and their “demonic” off-spring, which sets Blake off on a frantic path to find Lynn and escape the cultists’ clutches, in whatever way possible. 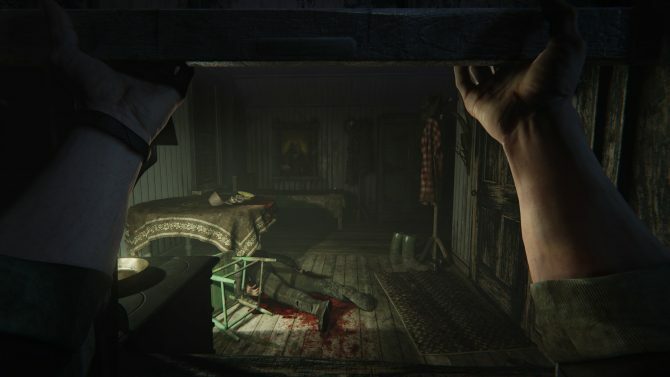 In the vein of true survival-horror experiences, Blake is defenseless against the cultists and other threats in Outlast II, with the player’s only means of defense against the unknown being to run and hide, or to utilize Blake’s video camera to see enemies in the dark and sneak around them. 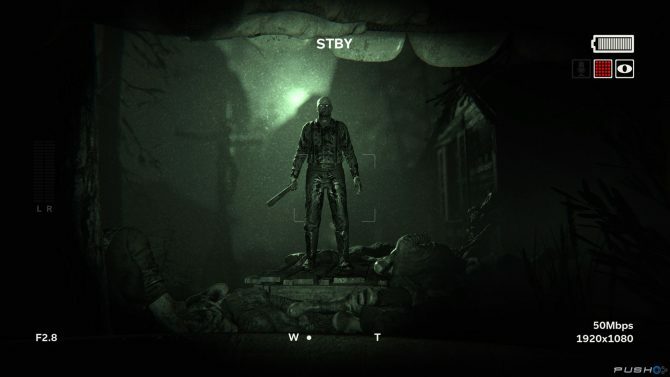 Armed with a night vision mode (and a new microphone setting that can let player hear through walls and other objects), the camera quickly proves itself as the most valuable tool that players have to avoid enemies and almost certain death. With only a small amount of power and batteries to use with it, however, Outlast II forces players to always be mindful of their (incredibly limited) resources and where they can break the line of sight with impending enemies. For the most part, Outlast II takes the bones of the original game’s core mechanics — using the camera to see in the dark and seek hiding places in the environment — and builds on them minimally. Aside from the integration of a few new features, like the previously-mentioned camera’s microphone and recording certain objects in the environment to document Blake’s journey, Outlast II plays almost identically to its predecessor. 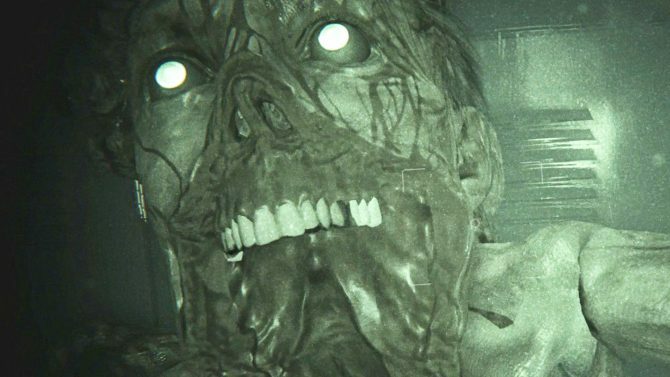 This isn’t necessarily a bad thing, as Outlast II‘s loop of using the camera’s night-vision to see in the dark and then (subsequently) flee in terror from unspeakable horrors is still incredibly frightening and heart-pounding. However, those expecting more development from the series’ gameplay won’t find too much new here mechanically, as the game’s few new additions are largely inconsequential. Instead, Outlast II‘s biggest deviation comes from its setting and tone, which abandons the original game’s asylum setting for the Southern Gothic trappings of its Arizona deserts and mountains. While the original game’s asylum played much like an elaborate haunted house, Outlast II‘s rural farm houses and abandoned chapels house a completely different kind of terror rooted in extremist cults and ancient evils, making for a truly harrowing experience in a setting that feels far more believable and unsettling. 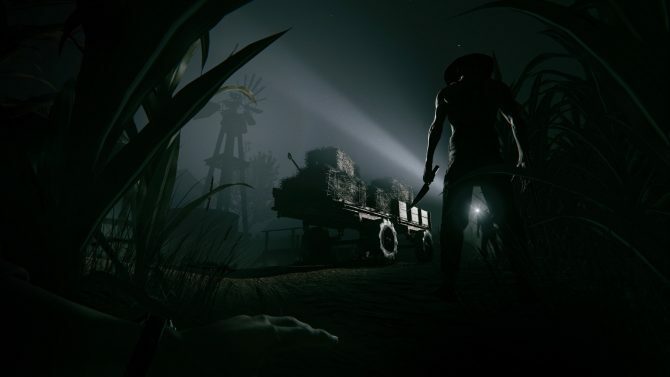 Fans of iconic, rural-set horror films like The Hills Have Eyes and Children of the Corn are going to find a lot to like in Outlast II. Complemented by the game’s beautiful lighting effects and near photo-realistic environments, Outlast II delivers an exceptionally scary new set of environments for players to explore — and to cower in fear over where Blake has to head next. Whether trekking through the dark, moonlit forests or creaking through the pews of a decrepit old church, Outlast II is consistently (and relentlessly) inventive when it comes to its environments and where it leads the player next, with locations that inspire as much curiosity at what happened as they do sheer terror and the desire to just turn around and hide all together. A good deal of that terror comes from Outlast II‘s expanded scope and maps for players to play hide-and-seek in, with environments that are far more open and accessible to player experimentation, compared to Outlast‘s cramped hallways and corridors. 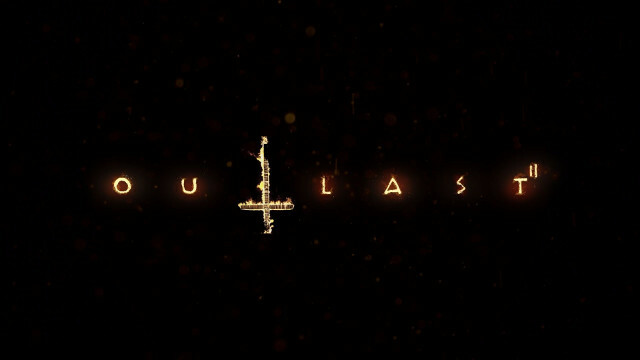 While the larger scale of the environments means that players will have to work harder to break away from enemies on their tail, Outlast II supplements this with even more ways to escape from enemies and catch your breath — even if it’s only for a few moments before they pursue you again. Namely, this involves everything from sliding under chicken wire, to crawling under fences, to hiding inside barrels filled with incredibly questionable liquids that you’re (probably) better off not knowing what is actually inside. Outlast II uses its farmland setting to an incredibly effective degree, and it’s sure to keep you on edge throughout its roughly 8-10 hour run. 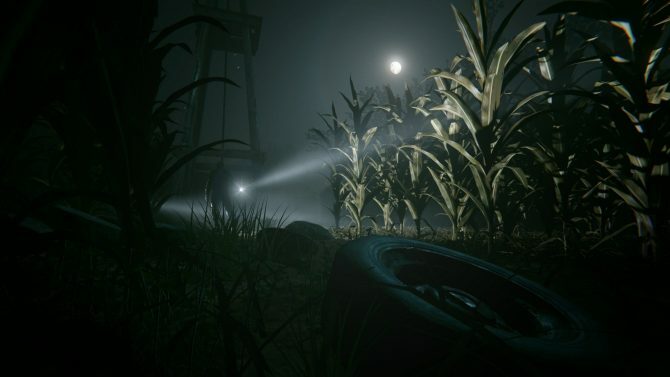 I only need to bring up one of the game’s most terrifying set-pieces — running through a darkened corn maze — to illustrate the fact that yes, Outlast II is going to scare the s*** out of you. However, the game also dips into the supernatural through numerous sequences exploring Blake’s history as a child at Catholic school, and while I won’t go into too much detail for fear of spoiling it all, the clean hallways and darkened classrooms of these sections prove to be just as sinister as the rural farms are by the game’s end. Given its stellar visual presentation and sound design that will make you thing you’re stepping on human organs and long-dead bodies, Outlast II absolutely drives home the terror of its setting, with only a few stumbling blocks along the way. The most prevalent of these issues come down to navigation and progression, as the more open environments of Outlast II sometimes present just as much a challenge for players to figure out where to go as they do the chance to find a place to hide. Red Barrels’ level design is mostly well-suited to guiding players toward their (eventual) goal while still keeping a large, open scale, though the lack of a clear direction of where to go can sometimes lead to frustrating trial-and-error gameplay of “die, respawn, figure out where to go: rinse and repeat.” Those moments are few and far between but still can lead to some unclear direction and, as a result, aggravating circumstances when an enemy is mere moments from slaughtering you, and you’re stuck running in circles figuring out where to go. With its focus on cults and extreme religious ideals, Outlast II also strives narratively for a “deeper meaning” that sometimes exceeds its ambitious grasp. Compared to the more routine idea of exploring and uncovering the goings-on at an abandoned insane asylum, the religious bent to Outlast II sinks into deep, and often difficult topics of corruption, sexual abuse, and other ideas that can be far more grotesque than the blood and viscera that players encounter. On that end, Red Barrels delivers an engaging story between the gasps of horror and shock. 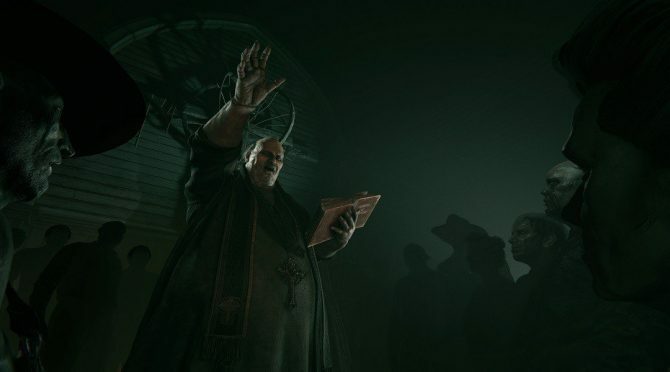 However, compared to the ways that Outlast II is so willing to push the envelope when it comes to violence and gore — which it does plenty — narratively it holds back a bit from not only exploring some of these deeper topics, but also in providing more revelations to the questions it brings up. 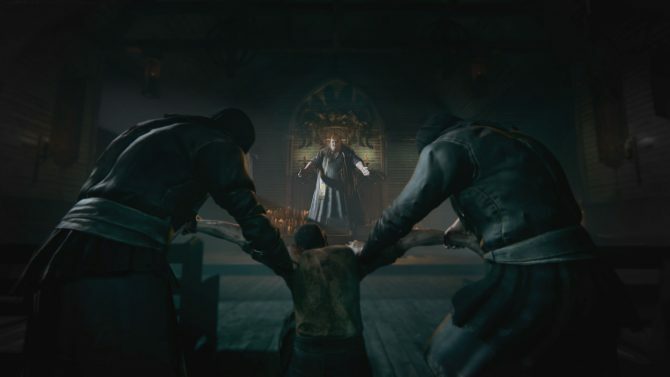 The game provides some compelling arguments in the case for exploiting religious beliefs to nefarious ends, but also (occasionally) swings in the opposite direction of using its fanatic cultists for mere jump-scares and bogeymen. By and large, though, Outlast II pulls (nearly) no punches in telling a story rife with blood and gore, but also with ideas on religion and faith that may prove to be far more unsettling. Despite its few setbacks, Outlast II delivers as a genuinely heart-pounding and thrilling horror experience. 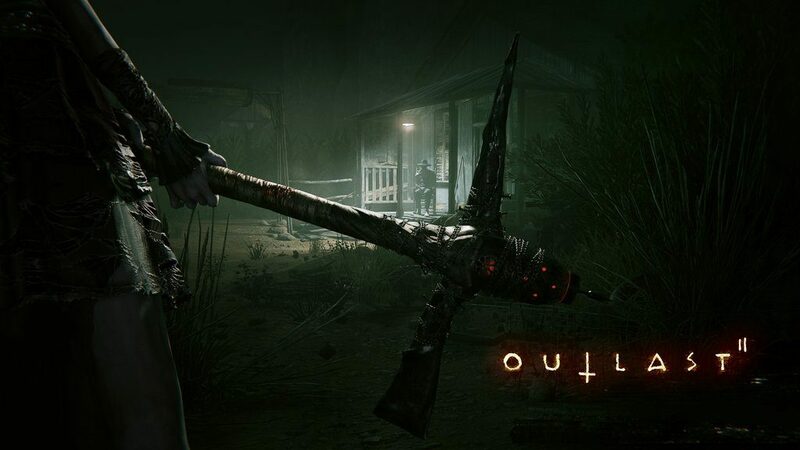 From rushing through corn fields with scythe-wielding maniacs on your tail, to uncovering the sadistic goals of the Temple Gate cult, Outlast II is sure to be a title that some players will find hard to put down from beginning to end or might drop immediately after the first 20 minutes: it’s absolutely not for the faint of heart. Outlast II excels on all fronts when it comes to terrifying players thanks to its convincing scares and setting, and while its copious amounts of gore will get under your skin, its bigger, grander ideas are sure to get inside a far more sinister place: your head.